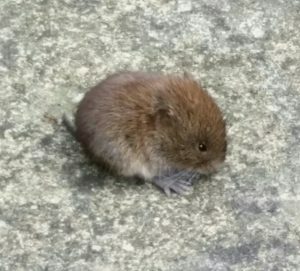 We had just returned from shopping when Maggie spotted this tiny visitor sitting motionless on our patio. My first thought was that it was dead, but its little eyes were taking everything in. It was the size of one of the larch pine cones that fall into our garden from the stand of larches alongside the house. We were concerned that a bird would take it as a mid morning snack, so we protected it by putting a metal grid over it. The spaces in the grid were large enough for it to walk out, or for a parent to come in to direct it. However after about ten minutes it decided to start exploring and set off looking quite normal and healthy. It explored the patio and nibbled at some weeds growing in the edging gravel. My usual reaction is to let things be, we have a few small mammals that pass through the garden when about their business, and, if they do eat a few strawberries, we should have plenty for all. However Maggie was keen to know what it was an scooped it into an ice cream box, added a hand-full of weed leaves and took it up the road to Reg, our wild-life advisor. By the time Maggie had carried the visitor, in its box the hundred yards to Reg’s house the little thing had consumed all the greenery provided for its journey! While Reg agreed that it had a cuteness quotient many times its size, he said that these little, greedy monsters had striped some new plants that he had just bought from a garden centre, and he recommended that the wee beast be taken for a long walk, anywhere else but near his garden. So our visitor was not with us for long, but I expect that all his brothers, sisters and parents are!